Displaying automotive parts effectively and safely requires high-strength construction and attention to design. Jack Sayers Ltd expertise in design and manufacturing ensures your car part display stand meets both these requirements, displaying heavy and potentially hazardous merchandise in an appealing and safe manner. 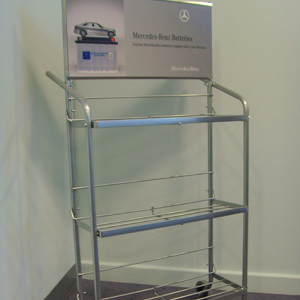 Contact us today to ask as any questions or order your car part display stands. Supplied with chain & padlock for antitheft.